A pottery dish of saucer shape, supported on a flat base with a low foot ring. The interior of the dish is incised with a carp swimming amongst waterweeds. The dish is covered in a layer of white slip, over which a green glaze is applied on the rim, followed by an inner ring of yellow glaze. 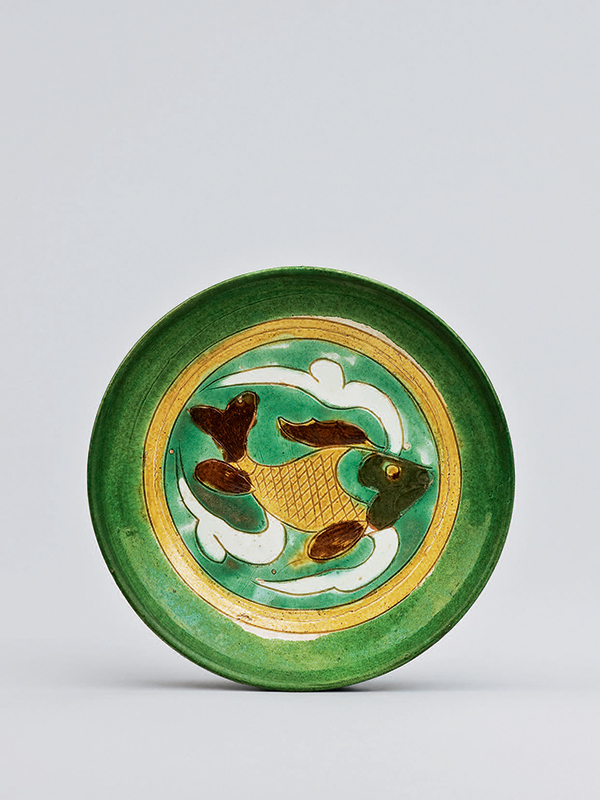 The fish is outlined by carefully controlled areas of green, yellow, brown and white glaze. Three small spur marks are visible on the interior. The reverse of the dish is unglazed, showing the light brown pottery body. Sancai dishes with incised designs such as the present example were once thought to date from the Liao dynasty (907 ­- 1125), but are now generally thought to date from the subsequent Jin dynasty, according to recent archaeological discoveries. Two closely comparable sancai dishes incised with a fish amongst waterweeds were excavated from a Jin dynasty tomb located in Shaanxi province in 1996. The three spur marks on the inside of the dish indicate that it was fired upside down causing the glaze on the outer rim to be both thicker and darker green, where it has pooled in the firing. A comparable dish depicting a fish swimming amongst reeds with flowers, dated to the Jin dynasty, is in the Meyintang collection. Two further closely comparable dishes, both dated to the Jin dynasty and incised with a fish swimming amid waterweeds, are respectively in the collection of the Palace Museum, Beijing  and in the Jiurutang Collection.